Reading is a key factor for being a well-informed trader. I do usually read trading books every other night before going to bed. I do also read news and financial journals during the day. Reading has become an integral part of my journey of self-discovery as a trader. I have come to realise that reading might not make you a successful trader, but at least it will shape you as one. Here, I will walk you through some of the truths about trading that I have discovered after reading Jesse Livermore’s book- How to Trade in Stocks. Trading is probably the hardest of all jobs. I am not sure whether it can be called a job or a hobby. For most it is just a hobby and for a few, it is a full-time activity. The percentage of the people able to make it to a full-time job is definitely small. Some say 5% of traders are successful, others say 1%. It might be true or not, but even if 0.01% of traders are making it big, it is probably worth trying. Rome was not built in a day. No real trader is made in a day. Persistence and hard work is what it takes. The rule of the 10,000 hours is definitely a leading factor. Chess can certainly teach us a thing or two about strategy; but the major factor that will improve the end result is practicing the skill itself. In every field, there are only a few individuals that make it big. Henry Ford, Albert Einstein, Michael Jordan, Tiger Woods. Why does the individual often succeeds in making landmark breakthroughs and the group does not. This still remains an universal unanswered mystery. “There are times when money can be made investing and speculating in stocks, but money cannot consistently be made trading every day or every week during the year. Only the foolhardy will try it. It just is not in the cards and cannot be done.” As I usually say- it is incredibly important to wait for only the best of trading setups! Do not over-trade! “Do not anticipate and move without market confirmation- being a little late in your trade is your insurance that you are right or wrong.” It is not important how often you will trade- what is important is that you are always trading when a positive confirmation from price action has signalled you that you should trade. “Experience has proven to me that the real money made in speculation has been: IN COMMITMENTS IN A STOCK OR COMMODITY SHOWING A PROFIT RIGHT FROM THE START”. “Real movements do not end the day they start. It takes time to complete the end of a genuine movement.” If you think that by opening and closing a position in the same trading day you will become profitable, you are probably belying yourself. The longer you stick to your profitable trades, the more your P/L is increasing in your favour. Cut losses fast and let winners run- this is one of the most essential philosophies in trading. The first time I saw this statement was when I joined my first job as a prop trader. The statement was written on the cup of one of the senior traders on the floor. What a legend! “Confine your studies of movements to the prominent stocks of the day. If you cannot make money out of the leading active issues, you are not going to make money out of the stock market as a whole. Just as styles in women’s gowns and hats and costume jewellery are forever changing with time, the old leaders of the stock market are dropped and new ones rise up to take their places.” Although this saying is mostly true about stock trading, the majority of traders will understand the meaning of that quote. Volatility is the best friend of the momentum trader. News and events are important and they do dictate the major moves in FX, indices and commodities, as well. We need a catalyst to see a major move- the same rule applies to all asset classes. “One major mistake of all speculators is the urge to enrich themselves in too short a time. Instead of taking two or three years to make 500% on their capital, they try to do it in two or three months. Now and then they succeed. But do such daring traders keep it? They do not. Why? Because it is unhealthy money, rolling in rapidly, and stopping for but a short visit.” How many times have you made this mistake? I bet it wasn’t just once. I remember once when I was trading solely in stocks, I had a long position in a regional bank share. Overnight they had major news of an acquisition and their share jumped over 150%. I rushed off to close that position and take profits only to find out later in the next few months that the share price did increase five-fold. I have repeated the same mistake with a pharmaceutical stock and an oil-drilling company’s stock. Traders do make the same mistakes, but it is unfair to blame it on them- it is our nature that plays a major role. We are constantly swayed between greed and fear and that is why mistakes are part of our nature. “It is significant that a large part of a market movement occurs in the last forty-eight hours of a play, and that is the most important time to be in it.” Again- cut losers fast and let profits run! This is one of the most famous quotes on the street and still the one that is most undervalued. If you want to be successful in this game, you’d better learn how to stick to your winners. If not, trading might not be for you. “I urge you always to keep a little notebook with you. Jot down interesting market information: thoughts that may be helpful in the future; ideas that may be re-read from time to time; little personal observations you have made on price movements.” Writing down any important observations or rules is crucial. I do also use sticky notes and have an economic calendar that I do myself every Sunday night. I am a keen believer in the preparation. I do also believe that you should be rehearsing all possible different scenarios of what might and might not happen. You should be ready to react in an unpredictable environment. You should be as prepared as possible. For the ones of you that are still unaware of my daily routines, you might find this article very useful. “It’s not the thinkin’ that makes the money- it’s the sittin’ and waitin’ that makes the money.” A major factor for driving profits is the ability to stick to the winners and cut losers fast. This is probably one of the most widely quoted sayings of the legendary Jesse Livermore. It has been ingrained in traders’ minds for many a year. As I have written in a lot of articles, the trading strategy is not the most important factor for being profitable. It is essential that you are following certain rules, but what is even more important is that you are disciplined. You should be able to sit on your hands when your P/L is showing a profit. You should be aware of how to scale-in properly only when you are in profit. You should be following your rules strictly and not making any exceptions even if you are making money! Quick profits is not what you should be after. “Never let yourself become discouraged by the fact that your securities are moving slowly. Good securities in time appreciate sufficiently to make it well worthwhile to have had patience.” That saying cannot be more true when it comes to FOREX markets. Sometimes it is necessary that you ignore all the noise from the small timeframes and concentrate on the higher timeframes. No matter what your gut feeling is telling you, you should be led by principles and discipline and not by emotion. You might be having 90% winning ratio, but if your winners are very small compared to your losers, then you are in trouble. You should be trying to cope with emotion and stay for as long as humanly possible with a profitable position. Very hard, but not impossible. “Remember- a speculator must set a firm stop before making a trade and must: NEVER SUSTAIN A LOSS OF MORE THAN 10% OF INVESTED CAPITAL! IF YOU LOSE 50% YOU MUST GAIN 100% TO GET EVEN!” This saying can best be illustrated by a table. I have used the same table as the one that Jesse Livermore has created. It is definitely a great example of what excessive trading will lead to. After looking at the table below, you will think twice before doubling-up on your positions…. “No matter how good a trader you are, losses are inevitable in the stock market and must be considered as part of your trading operating expenses, along with interest, brokerage fess, and capital gain tax.” As I have explained earlier, the worsts hope is the hope that you will never sustain a loss. 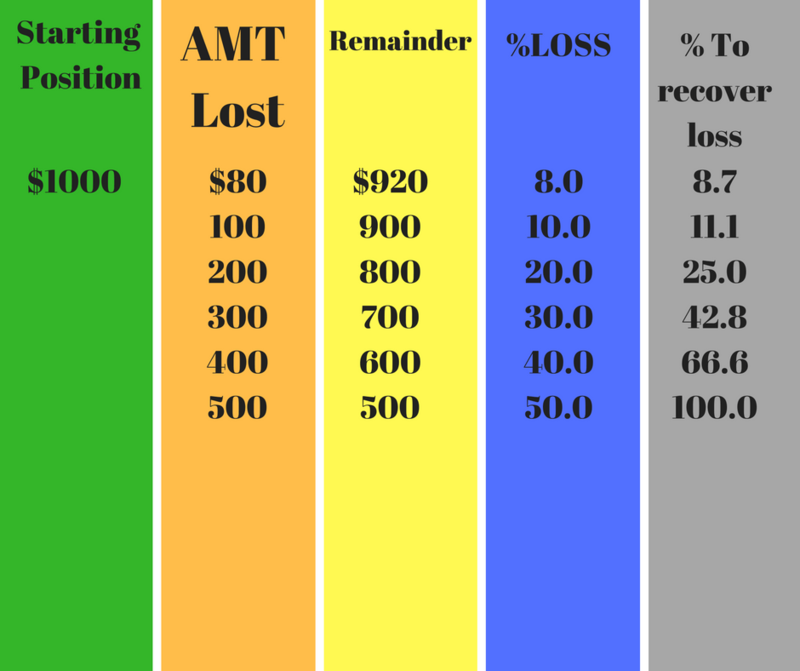 No matter what trading strategy you are using, losses will be part of it. You need to find a way how to keep them at bay and not sway emotionally too much. 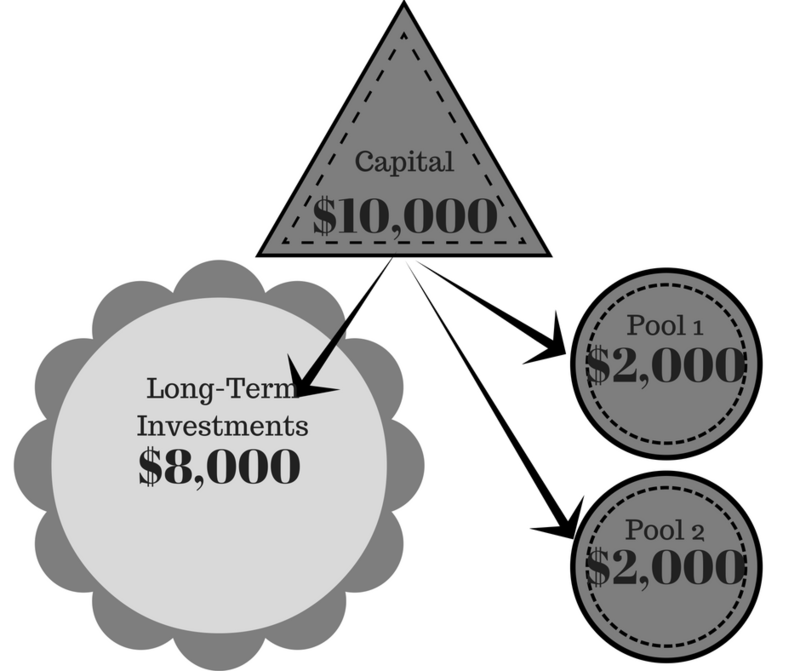 The most important asset is your capital and you should protect it as hard as humanly possible. If you think this is an overstatement, think about the ratio of winning to losing traders. Unofficial statistics say it is 95% in favour of the losing ones. If you still do feel overconfident, now is a time to rethink your approach to trading. “Remove hope from your trading lexicon. Always have a method of speculating, a plan of attack. And always stick to your plan. Do not constantly change your plan. Find a method that works emotionally and intellectually for you and stick to that method…” I can’t agree more with these wise words. Hope is definitely not the way to go. A good working trading strategy is definitely a must. Changing one strategy after another searching for the holy grail will only bring you disappointment. The constant tweaking and fine-tuning of a strategy might not be the best decision, as well. In my opinion what matters is just to stick with a simple, clear-cut strategy that has proven that works in the long-term. In the end, no matter how flexible traders are, they are one-trick ponies. As one of the most prominent traders of all times, Jesse Livermore has left us more than he has taken from the markets. Although his most famous trading book is “Reminiscences of a Stock Operator”, “How to Trade in Stocks” has definitely had more influence on me as a trader. I have read both books numerous times and must say that “How to Trade in Stocks” is ranking in my personal Top 3 greatest trading books I have read. Strangely enough, it is not as popular as countless other books for trading.